So, we are finally getting a little bit more sleep. Elisabeth, my wonderful 14 month old daughter is responding well to the sleep training we’re putting her through (for the second time!). She has never been a good sleeper so we’re very happy that she is now, finally, sleeping through most nights. Last night she woke up at 21.40 and cried so hard that I thought she was surely in enormous pain. But when I picked her up for a cuddle, she immediately stopped and snuggled against my shoulder. That’s when I realised I had been fooled, there was absolutely nothing wrong with her, she just fancied a cuddle. Understandable, yes. Acceptable, I guess as she is only 14 months old. Preferable, most definately not. So I put her back in bed and after another 5 minutes of screaming she went back to sleep. I settled on the floor under a, way too small, blanket and tried to have a bit of sleep myself as I knew she would be waking up every now and then to check I was still there. At 22.45 she was fast asleep and I managed to sneak out. 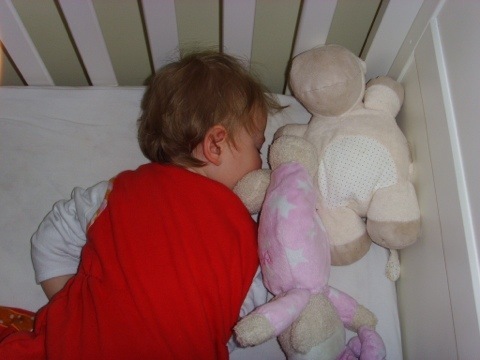 And this is how I found her this morning at 7.15……. Even taking this picture with flash didn’t wake her up, sleepy little monkey. Let’s hope we’ll have some more of that over the weekend! Those cries will get you every time, won’t they? My daughter could cry like her arm was being torn off; I’d pick her up and she’d nestle right back to sleep. Even though my husband and I knew she had us wrapped around her little pinky, it took us until 6 months to let her cry it out. I needed to sleep! They do, it is so hard to deicde whether there is anything wrong or not. It’s a good thing most of these methods work really quick (the one we used did anyway) because I don’t think I could just sit next to her listen to her cry night after night when all you want to do is pick her up. But they need to learn. Isn’t it wonderful to sleep again? We’re thoroughly enjoying it. Cute picture. She got you at 21.40. I’m sure you (and every other parent) gets suckered all the times. Darn kids! Enjoy her. Thanks! Yes, she definately got me. Clever little things they are.